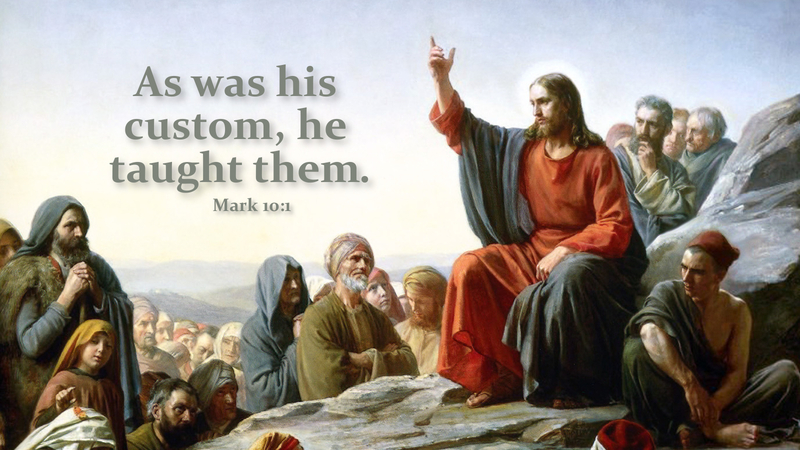 “And Jesus left there and went to the region of Judea and beyond the Jordan, and crowds gathered to Him again; and again, as his custom was, He taught them” (Mark 10:1). While in seminary, my professor Dr. Eric Gritsch would tell us there are two pillars that uphold every congregation, worship and education. As adults, we are pretty good about worship, but not so good at participating in ongoing Christian education. St. Mark tells us that as was Jesus’ custom, “He taught them.” In the Great Commission in Matthew 28, Jesus charges us to “Go and make disciples of all nations, baptizing in the name of the Father, Son, and Holy Spirit, TEACHING them to observe all that I have commanded you.” Most don’t realize there are actually two parts to the Great Commission—making disciples through Baptism, and teaching! Of course, the simplest way for adult Christians to participate in “teaching” is through sermons—as preaching is often teaching. Many of us have our only Bible Study in the sermons we hear on Sunday mornings. This is not an inappropriate way for us to get deeper into God’s Word—learning what Jesus has commanded us. However, there are many opportunities in every congregation for in-depth, interesting and exciting adult Christian education! Congregations usually offer Sunday adult classes, midweek Bible studies, women’s and men’s studies—the list is often long. Why don’t adults avail themselves of the opportunities to keep learning as Christians? Often folks tell me they are afraid to show how ignorant they are of the Bible and Christian teaching. Sounds silly, but most of us are uncomfortable participating in something that might reveal how much we don’t know. I invite you and encourage you to come be a part of some “teaching/learning” opportunity at church! How else will we learn and grow, unless we put ourselves in a position to be taught? Prayer: Almighty God, help us to learn all that Jesus has commanded us! In Jesus’ name we pray. Amen.